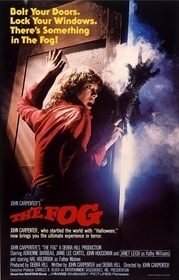 I can't remember exactly when I first saw The Fog, but I know the experience was within a year or so of its original 1980 release. As a kid growing up in the 1970s, I had the good fortune of having my formative years molded by one of the most powerful, prolific chapters of American cinema. All right, let's face it: I was truly blessed. I didn't know it then, but I sure do realize that now. The Fog is one of many films that forever embedded the power of cinema in my impressionable, adolescent brain. The movie freaked me out when I was a kid, and that experience is probably one of the reasons why I currently write for Classic-Horror. Although released in 1980, the film bleeds with everything that is wonderful about 1970s American cinema. And I have to admit my bias now: I love Carpenter's early work but struggle with his later work. As with many, the cut off date for me is about 1982. It is hard to find a more impressive run of horror/thriller classics than Assault on Precinct 13, Halloween, The Fog, Escape from New York, and The Thing. But after those five films, what I have seen of the rest cloud his oeuvre. Fortunately, The Fog is in that former set. The film marks Carpenter's first horror project after Halloween, which by virtually everyone's definition was a "classic" that launched his career and redefined a genre. Following Halloween was a challenge akin to batting immediately after Barry Bonds. Nevertheless, Carpenter came through and hit another home run with The Fog. The script is profoundly original, and few, if any, films have attempted to emulate it. If anything, the decision to offer a remake, which is scheduled for a mid-October release, is a testament to this film's enduring power. Lurking amidst the fog of Antonio Bay is a dirty secret, and Father Malone knows it. Malone, played by Hal Holbrook, is a local priest who refuses to participate in the centennial festivities of a small Northern California fishing village. Mayor Kathy Williams, played by icon Janet Leigh, wants a robust celebration, but Malone, who earlier in the day found his grandfather's old, cryptic journal behind a brick wall in his church, learns about the village's duplicitous and murderous past. That past centers around a wealthy leper colony patriarch named Blake, who wanted 100 years ago to establish an island refuge for his sickly followers. Malone's grandfather acquiesced, but deceitfully, the villagers, in an attempt to pad their village's coffers, lured Blake's clipper ship into treacherous waters, and the ship sank. Now, the ghosts of Blake and his followers want some serious payback. I'm not sure there is a sexier lineup available with goddesses Leigh, Adrienne Barbeau, and Jamie Lee Curtis (JLC) leading the way through this fog. Each convincingly portrays her character, and each excels at conveying terror. The phenomenon of seeing JLC and her mom on the same set is also fascinating. Although they don't share many scenes, their performances must have been enhanced knowing this film was literally a family affair. The rest of the cast also shines with Holbrook playing the curmudgeony old priest, John Houseman making a cameo as the crusty old storyteller in the film's provocative opening, and Tom Atkins and Nancy Kyes, who also worked with JLC in Halloween, as some of the locals. Even Carpenter himself makes a Hitchcockesque cameo early in the film as Bennett, Malone's assistant. The originality of this film is striking. Fog is often a staple on horror sets, but rarely has fog itself become a protagonist. Here it does and deservedly so. We await its presence as much as we dread what the fog brings. We also have a drama that is essentially narrated by a female radio deejay, Stevie Wayne, played by Barbeau, who is isolated in a picturesque lighthouse. Rarely have horror films been omnisciently narrated with such realism. Also, the scenes of the bay and lighthouse are breathtaking, but the feeling of claustrophobia and desolation they create undermines their beauty. The lighthouse footage immediately foreshadows an entire town on the brink of chaos, and viewers quickly anticipate the inevitable horrors that will unfold. The film's boogeymen are also unique. They represent an unusual hybrid between the spectral presence of ghosts and the decaying flesh of zombies. Because they are lepers, their wormy appearance is associated with zombies, and Carpenter cannot resist at least one close-up of a muddy, wriggling "face". However, unlike most zombies, who seek flesh purely for survival, these dead souls apparently want nothing more than vengeance, a characteristic usually assigned to ghosts. The lighting and fog these ghosts are draped in also establish an almost classical feel to their spectral presence. Carpenter's use of a 2.35:1 aspect ratio allows the camera to capture the full complexities of his narrative. Throughout the film, panoramic shots reveal both subtle details and vast palettes that paint interesting paradoxes. This binary approach to symbols is perhaps one of the film's greatest contributions. The open sea directly contrasts with the closed footage in the church, lighthouse, and various cars. Scenes of the bay are shot in both the night and day, and viewers quickly realize both exist within each other. During the day, darkness lurks in the town's dirty secret; during the evening, light shines with the hope of the ghosts finally obtaining vengeance. Ironically, in this context, we almost sympathize with the poor fellows of Blake's ship and root for them. Finally, the entire script also reminds us of the differences between a maritime and terrestrial existence. The fog itself is an interesting meteorological reminder of that paradox. These contradictions add a disturbing, sophisticated layer of tension to an already creepy film. While alarming stories of deceitful fathers and grandfathers guide the narrative, creating within the film an unsavory patriarchal order, it is the women who struggle the most with these ghosts. The mayor and her assistant are female, and their political ambitions are thwarted by a male's 100-year-old transgressions. Although a male (Houseman) begins the story, Stevie Wayne's narrative consumes his tale. Clearly, Carpenter depicts Wayne as the most powerful character in this film, one who is literally above the shenanigans unfolding in the village. A woman with a man's name, succeeding in a man's profession (radio journalism, especially in the early 1980s), and offering her broadcasts in perhaps one of the greatest symbols of patriarchy, a lighthouse (add light keeper - another male-dominated occupation), Wayne is in many ways the hero of this film. As a single mom, she fights to protect her son and does not succumb to male advances. In a sense, she saves the entire village from a patriarchal system gone insane. The film's obsession with narratives also highlights another important theme in this film. Stories within stories abound, and seemingly everyone in this film is telling some kind of narrative. The film opens with Houseman telling a group of children a ghost story about Blake's unfortunate ship. He is brilliant in a mischievous, grandfatherly kind of way. Interestingly, Carpenter added this Houseman scene in post-production because he didn't have enough footage to satisfy his bosses. This was a wise choice because it sets the film's tone perfectly. Later, when JLC's character is picked up hitchhiking, she tells the driver her story although it contains lies. Holbrook tells the story of his grandfather, and Tom Atkins, whose character quickly hooks up with JLC, tells yet another interesting story while on the ship investigating the disappearance of his buddies. And of course the ultimate storyteller, Stevie Wayne, narrates the entire onslaught of Blake's colony as they descend upon the residents of Antonio Bay. Even legendary storyteller Edgar Allan Poe finds a short stage in this film when Carpenter uses one of his quotes for the prologue. Although these meta-narratives serve as a testament to the power of storytelling, Carpenter might be seeking something else. Each story contains danger, and when these stories are told, both the storyteller and listener share the focus. Each seems to be equally important. There also seems to be an obsession with not only the stories themselves, but also how they are told and when and where they are told. In other words (no pun intended), while the stories are important, the ways they are interpreted are equally, or more, important. This post-modern twist, one that subscribes to the belief that the medium is as important as the message, is unique because the film showcases the dangers in how modern audiences succumb so easily to storytelling. By focusing on the storytelling and not the story, we become seduced and forget the actual message of the story, which in many cases forecasts great danger. This leads to the film's most powerful message. Like so many classic horror films including The Shining and others, a scream for a revisionist view of history lurks in their soul. Whether Carpenter intended this or not is irrelevant; the interpretation is there for any astute viewer to wrestle with, if they dare. Father Malone says it best when he challenges the mayor's fervor for a grand centennial celebration: If we celebrate this town's centennial, we will be celebrating murder! Because he is a priest, this accusation gains more weight, and because the murderous conspirator is his own grandfather, this poignant introspection makes his accusation even more persuasive. The fatalism in his tone is powerful, because as a man of the cloth, he knows penance is coming. Incriminating histories die hard, Carpenter seems to be telling us, and any attempts to hide such histories are pointless. The brick wall that conceals the fateful journal is a stark visual reminder of how many layers of lies, stories, and time people will construct to conceal such dangerous historical facts. The fog itself is a metaphor for our capacity to obscure and reveal dirty truths. The music is also classic Carpenter, and although the composer actually scrapped his original score and rewrote it to better match the film's vibe, viewers benefit greatly from his acute sense of rhythm, composition, and tone. His stark notes add another layer of complexity to a film that too often is forgotten. The editing is also brilliant; at 89 minutes, the film packs quite a punch and is worth every second. Frankly, I don't know what to expect with the remake. Not being a huge fan of remakes in general, I am not expecting much, especially when the original is brilliant. However, since Carpenter himself is co-producing it, and since he handed over creative control to director Rupert Wainwright, the remake should have potential. I just hope Carpenter's original, complex vision isn't lost in a fog. Submitted by Wayne (not verified) on Wed, 2010-12-08 13:22. Submitted by captain basil on Sun, 2011-02-27 09:27. I saw this at the theater with a bunch of friends. It's a fun, scary film. The remake was terrible, as most remakes are. I think Carpenter's true gift is that he genuinely likes horror movies. That's a rare thing in mainstream Hollywood. Submitted by Joseph (not verified) on Fri, 2012-04-13 07:21. I too love this movie. Its one of the best horrors I've ever seen. and to think I saw it for the first time around 1994... a true classic. I was extremely disappointed with the remake, it reminded me of pirates of the carribean. It was more of an adventure than a horror. not to mention tooooooooooooooooooooooooooooooooooooooooo much visual effects. The original is much much much much better. Submitted by G (not verified) on Sun, 2012-04-22 03:12. "If we celebrate this town's centennial, we will be celebrating murder!" "The fog itself is a metaphor for our capacity to obscure and reveal dirty truths." <-- The kind of insight many reviewers neglected to take note of. Submitted by Anonymous (not verified) on Tue, 2013-10-29 18:01. Sorry, but "The Fog' is a piece of un-scary crap.